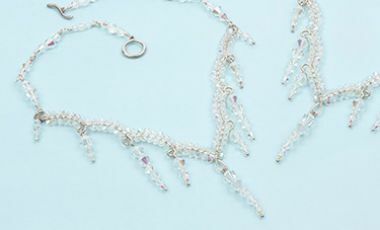 Create a beautiful, crystal embellished necklace using shimmering glass crystal bicones and silver plated copper craft wire. Follow Lynda’s project below and make your own gorgeous wire necklace with crystal droplets around the V shape at the centre. This design is the perfect bridal design and can be made even more special by swapping your glass bicone beads for beautiful Swarovski bicones instead! Find your Swarovski bicones in Crystal AB here and choose your 4mm, 6mm and 8mm beads. Step 1) cut a 40cm length of the 0.8mm wire. Find the centre point and create a loop in the centre of the wire. Step 2) measure a point 5cm away from the first loop on the working wire. Use your round nose pliers to make a loop at this point, curving the wire slightly between the two loops. Step 3) measure a point 5cm away from the new loop you made and repeat the process from step 2. Repeat the process one more time so you have 4 loops in total. Step 4) finish the end of the wire off with one final upward facing loop. Step 5) repeat steps 2-4 on the other side of the wire. Your finished piece should look like this. Step 6) cut a 2m length of 0.4mm wire and anchor the centre of the wire to the centre loop on your wire frame piece. You should have two working ends of equal length. Step 7) add a 4mm crystal to one of the new wire ends. Position it above the curved wire on your frame, then wrap the working wire around the frame twice to lock it in place. Step 8) add another 4mm crystal to the same wire, position it neatly next to the first one then wrap the wire twice again. Repeat this process until you have filled the whole curve with crystals. Step 9) continue along the length of the wire frame until there are crystals all along the one edge. Repeat the process along the other side with your second working wire until the top edge of the frame is completely filled. Step 10) cut another 2m length of 0.4mm wire and anchor it at the base of the centre loop as before. Add a crystal to one end of the new wire and position it on the underside of the curved wire. Wrap the working wire around the frame to anchor, using the point between the previously added crystals to position it. Repeat this process all along the curve again. Step 11) continue adding crystals to the underside until the whole frame is full, then repeat the process on the second side. Step 12) add two 4mm crystals, two 6mm crystals and two 8mm crystals to a ball ended head pin. Create 3 icicle droppers like this. Step 13) create some smaller icicles by adding one crystal of each size to a pin. You will need 4 icicles this size. Step 14) roll the tops of the headpins with your round nose pliers. Before closing the loops completely, attach the icicles to the loops on the crystallised wire frame. Ensure that the central icicle is a long one. Step 15) Position the remaining icicles so that the sizes alternate as shown. The very end loops should have shorter droppers made using one 4mm, one 6mm then another 4mm crystal on to finish. Step 16) to finish, add a length of chain to either side of the icicle piece. You can either use ready made chain or create a beaded chain using the remaining crystals and 0.8mm wire like the one shown. When you are happy with the length, add one part of the toggle clasp to each side and your necklace is complete!